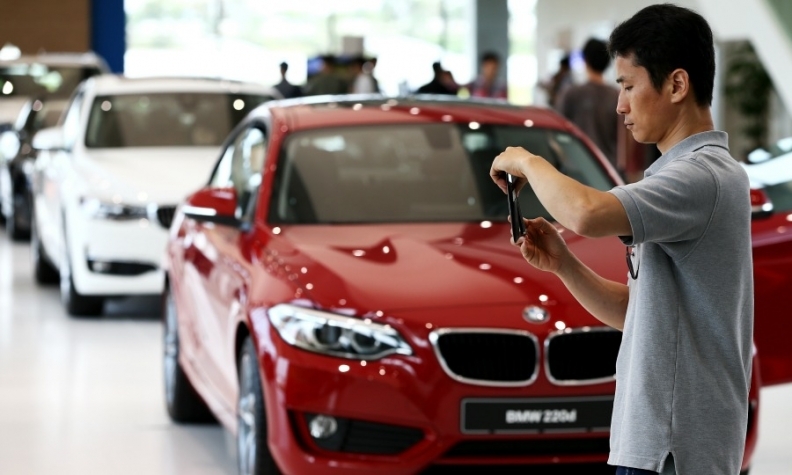 A visitor photographs cars at BMW's driving center in Incheon, South Korea. Sales of BMW vehicles and other premium brands are driving foreign car imports to record levels in South Korea. SEOUL (Reuters) -- South Korea is on track to spend more on vehicle imports from Europe this year than it earns from exports in the other direction, for the first time in 24 years, as German brands including BMW and Mercedes-Benz breach the once-impregnable fortress of Hyundai Motor and its local rivals. The turnabout follows a 2011 free trade deal eliminating duties on vehicles from Europe, and as tastes change in a market once so patriotic that foreign cars were sometimes targeted by vandals. Imports made up 3 percent of cars sold in South Korea a decade ago and now account for a record 14 percent. German cars make up 71 percent of foreign cars sold in South Korea this year. "The driving force of imported cars has been diesel engines, younger customers in their 30s and luxury brands," said Yoon Dae-sung, an official at the auto importers association, who expects further growth to be driven by mass-market, non-German cars. The value of imports from Europe was up 60 percent to $4.6 billion in the first nine months of 2014, customs data showed, against exports of $4.4 billion. "In the past, Korea lagged behind and had to catch up very fast, so we had to give benefits to domestic firms," said Park Hyun-suk, a businessman in his early 40s who lives in Seoul's affluent Gangnam district and drives a Mercedes E class. "But they are not small companies anymore and we have no obligation to support them. We have to be set free now." A free trade deal agreed last week with China excluded cars, to the relief of local automakers, staving off a potential influx of China-made German-branded vehicles and helping to preserve South Korea's status as one of few markets where domestic automakers hold a dominant share -- for now. In Gangnam, the center of the foreign-car boom, a Volkswagen store does not have enough vehicles to sell, said dealer Kim Young-chun. "We are not taking orders for the popular Tiguan white version anymore because we have already secured about 70 to 80 orders at our store alone," he said. As well as the support of patriotic consumers, Hyundai, its sister firm Kia Motors, and others such as SsangYong Motor Co. were once protected by 50 percent import tariffs. In the early 1990s, when South Korea had a more protectionist industrial policy, some consumers shunned foreign cars for fear of being targeted for tax audits. Trade deals have helped South Korea emerge as a source of growth for global brands, which are expanding offerings from big vehicles to smaller ones, threatening to further erode the nearly 70 percent market share held by Hyundai and Kia. U.S. cars have not gained as much as from a similar trade pact with South Korea, the world's 11th largest car market. In August, BMW opened a $64 million driving center in Incheon, its first in Asia, allowing visitors to test-drive BMW and Mini cars on a 2.6 kilometer (1.6-mile) track. Japan's Toyota Motor, which imports its Camry sedan to South Korea from the United States, last month opened a cafe and showplace in Seoul that displays but does not sell its Lexus cars -- part of efforts to raise its brand image. In the first 10 months of 2014, foreign car sales in South Korea rose 33 percent, while Hyundai sales rose just 3 percent. Hyundai is fighting back. Last month it launched its Aslan premium sedan, a rare model targeted mainly to local buyers, and recently opened a flagship store in Gangnam. Hyundai and Kia are also expanding their diesel and hybrid offerings.